BREEDING AND KEEPING BETTA MACROSTOMA – Now we’re eager to cultivate and maintain another of betta fish families, wild betta. Therefore some of this time and will come, we’ll learn more and review how to care for and breeding wild betta. 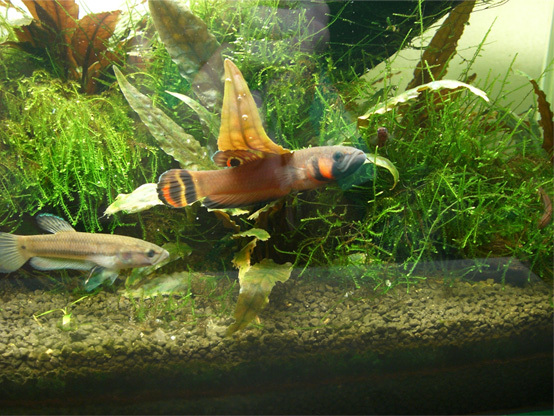 Like today, we begin with a lesson how to take care and breeding of betta macrostoma. Hmm, some fish seller just think how to catch this species from their natural habitat without eager to cultivate and keep this wild betta, their motivation only economic. Have you ever thought about keeping macrostoma? The tropical fish hobby is full of fish that many people claim to be too difficult to keep and also fish that are on many people’s dream list. B. macrostoma is frequently one of these fish. This betta can be very rewarding to keep and their personalities and aquarium behavior are a lot of fun to watch. Here are some suggestions on how to successfully keep and even breed betta macrostoma. Remember that tank raised specimen are much easier to care for than wild fish. If you can find some F1 fry, that is probably the best (and cheapest) way to start with macrostoma breeding. This betta can be kept in pairs as long as they have a decent size aquarium. A 40 gallon tank is ideal. This gives the male and female plenty of room to get away from each other when one or the other is a touch moody. Provide plenty of places for them to hide. The more places you have for them to hide, the safer they feel and the more you will see them. We can use driftwood with java moss and java ferns growing in the aquarium and on the wood. PH should be low. 5.0 – 6.0 is great, but you may find higher or even lower is needed to stimulate successful breeding. Clean water is a must. Frequent water changes are needed, meaning 50% or more a week. Some other suggestions for making happy Macs is to add Almond leaves (ketapang in indonesian) to the tank. Some references suggest to add 2-4 leaves per 40 gallon tank. Betta Macrostoma can be tricky to breed at first, but with some patients and setting your tank up properly you can eliminate a lot of problems. First off: a reference been reminded us that the parents DO NOT need to be separated (and this includes from the fry). This is the rule, not the exception. If you have a pair that is unusually aggressive, then you need to experiment with how to keep them. some breeder have ever successfully bred, they have never had to separate the parents. Add PLENTY of hiding places for when someone is cranky! Feed your macrostoma parental plenty of live foods, including worms, mosquito larvae, flakes, frozen, etc. They are rarely picky, so offer them numerous foods. This will get your Macs into full breeding condition. Your macrostoma parental generally started mating early in the morning and usually continued for several hours. Do not bother them, as they are easily startled and will eat the eggs! This brings us to another MUST HAVE HINT! At this point (or even before spawning) make sure you have your aquarium completely covered. The male is very apt to swallow the eggs if he sees movement around the tank! You will notice that the female will have very dark horizontal banding, this is usually a good indicator that she is ready to breed. The male will be flashing her and his colors will be very bright as well! Once the mating is complete, the male will generally go into hiding. This betta, like many wild bettas are very good jumpers. So please remember to have a top on your fish tank. You male macrostoma will generally hide after breeding and if you are lucky to see him you will notice that the bottom of his mouth is bulging. These are the eggs he is carrying. If the spawning was successful he will carry the eggs/babies for about 20-22 days. Generally the male will eat the eggs around days 3-5 if something went wrong. We usually found this to be linked to PH (meaning it was too high at the time of spawning). After 20-22 days he will spit them into several "safe" places in the tank. Neither the male or the female should bother the babies. Make sure you have plenty of baby brine shrimp available at this point. Baby betta macrostoma are eating machines, and need to be fed about 5 times a day. Make sure their bellies are always full. Water changes will be more important than ever now. You are feeding more than normal and there are a bunch of hungry babies that are also creating a lot of waste. Daily water changes are recommended. If you are looking for a fry safe. Simply tips, place crushed lava rock in the bottom and floss on top. They are efficient and perfectly safe for the newly released fry. It is ok to remove the babies and put them into their own tank. It is up to you, depending on your set-ups. Remember to just use the water from the breeding tank. The babies will grow VERY quickly and should be 1-2" long in about 3-4 months. As they grow, make sure you feed them accordingly and diversify their diets. Once they are around 1" long they do start to get aggressive to each other if they are cramped. At this time it is nice to start to break them down into groups of 5-10 per tank. Hopefully you can provide at least a 20g tank per group. Based on experience some breederh who succesful on KEEPING AND BREEDING BETTA MACROSTOMA, An average spawning of betta macrostoma yields 25 fish, but their largest result was 105 babies, Bravo! !.